Last night we began a new series, TEN, on the Ten Commandments. Last night’s key point was “Relationship Before Rules” as we introduced the series. The commandments were established after the relationship had already been initiated. The rules were the framework for the relationship. 10 years of youth ministry has taught me that he’s exactly right. Regardless of the situation if teens have a relationship w/ the adult they will respect the rules. If not prepare for the worse. Parents, for some great insight from Jim Burns on the importance of nurturing relationships w/ your kids even in the midst of discipline watch this video. 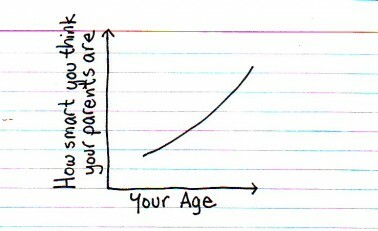 How Smart Are Your Parents? 1 of the very best youth ministry resources for keeping up w/ the youth culture is the Center for Parent & Youth Understanding. It’s weekly email newsletter is the best youth ministry newsletter that arrives in my inbox. I’m faced w/ that question on a regular basis or something similar like “Is it ok to ground my teen from church?”. My blunt answer is yes! It seems to me that the same reason that governs why they have to brush their teeth, go to school, get some sleep, take baths, should be the same reason that governs why they should go to church, it’s important! So we make/force our kids to do everything that we think is important so if we don’t make/force them to go to church does that mean we don’t think it’s important? As a parent, it may not always be popular to make them go to church but it has eternal implications. It’s not just about their attendance, it’s about their eternity. We who are charged with the care of students (parents, youth pastors, teachers, godparents, etc.) must see to it that they find The Way and are trained to live in that Way. Also know that training is not always easy, comfortable, or fun, and usually doesn’t come without a bit of pain. A very respected parent recently told me, “I don’t care what they want to do, I (as the parent) am committed to getting my kids in environments where they can grow closer to Christ.” He believes it’s important, so he follows that up with his actions. Last night we kicked off our lead teams. Teams made up of 10-12 parents & a couple of high school students. Their agenda is to help guide our student ministry in our weekly events & big events like summer camp. The teems meet on Sunday nights every other month. It’s just 6 hours per year that each person is committing, but it’s worth so much to our ministry. I highly suggest reading this article by Sam Rainer. He gives some great practical advice for parents of teens. Today, we are at summer camp. We’re also mailing out a letter to let parents know how everything is going & gave parents a few suggestions for when their teen gets home. The idea isn’t mine. Josh blogged about it last year & Mark did earlier this summer. In fact much of the language in our letter is very similar to theirs. In the letter we thanked parents for trusting us w/ their teen, gave them a brief description of what’s been going on at camp, & asked them to pray for their teen, the worship leaders, their teen’s family group leader & the adult staying in their teen’s condo. Let them sleep. They didn’t sleep much @ camp, so their bodies are desperate for lots of sleep. Be an encourager. We asked them to say “that’s great!” & “I’m proud of you!” Teens typically return home from camp on a spiritual high & we really want our teens to know that their parents support their spiritual growth. Nothing means more to a teen than the support of mom & dad. What have you done to help parents connect w/ the experience their teens have had at camps/retreats/mission trips? Plus, it’s a lot of work. We held a parents meeting because ministry is about people. Youth Ministry doesn’t happen (at least over a long period of time) unless parents have trust in the youth ministry staff. Much work was put into it. We began working on the agenda several weeks ago. What do we need to cover? What do we want the mood of the meeting to be? What’s the objective? We made the agenda. Added in some humor. Recruited volunteers to serve at a registration table so parents could turn in $ & forms. Had a notary public present to help out parents w/ the release form. Covered everything & allowed for questions. Didn’t make the meeting last any longer than it had to be. Arrived early to meet parents. Allowed about 30 minutes for parents to submit forms & $. Then met for about 20 minutes. Thanked parents for trusting our ministry w/ their teenager. Hung out afterward to allow for more question. Parent meetings are old school. I’ve heard horror stories about them. However, a purposed & well planned parents meeting is very valuable in gaining parent’s trust & support. Do you hold parents meetings? How often? Just before big events? Any horror or success stories to share? You’ve likely noticed that my blogging has been really slooooow lately. Lots of reasons. Job change. Busyness of summer youth ministry. Seems I’m twittering (follow me) stuff that I use to blog. The main reason is that it feels like Neil’s Blog is changing. I’ve had that feeling for months, but my job change back in April has been the biggest thing behind the change. This place started primarily as a way to communicate w/ youth parents @ Parkway. It worked & many of y’all are still here. Although I’d like to stay in touch w/ y’all – I”m no longer communicating for that ministry. The FBCJ student ministry communication is still very much in the works – right now we are using our facebook page to communicate w/ teens (& more & more parents) & old fashioned letters for parents. I feel like the direction for this blog will be directed more & more to youth ministry issues. I’ll still throw in the occasional story from the lives of Amanda, Roscoe (he’s sleeping if you are wondering), & myself. I may even attempt to give this place a makeover.